"As nitrous oxide in its extensive operation appears capable of destroying physical pain, it may probably be used with advantage during surgical operations in which no great effusion of blood takes place." Humphry Davy was born in poverty to a Cornish woodcarver. As a teenager, he was apprenticed to a surgeon-apothecary. When only nineteen, he was appointed superintendant of Thomas Beddoes' Pneumatic Institution in Clifton. In 1801, he moved on to the newly-established Royal Institution in London, where he was Professor of Chemistry 1802-13. He was President of the Royal Society 1820-27. 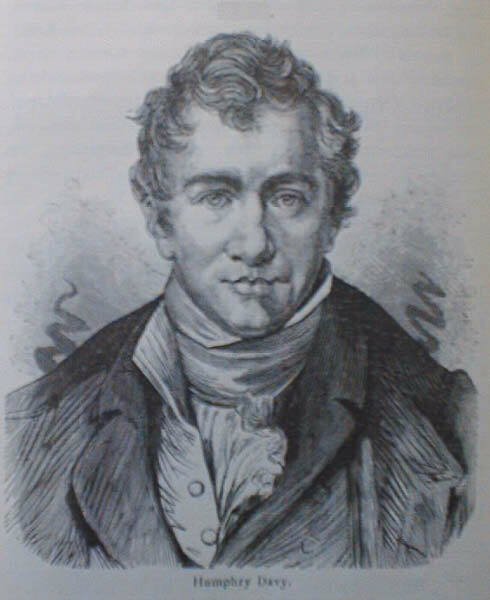 Davy isolated sodium and potassium, laid the foundation of electrochemistry, studied the electrolysis of salts in water, and invented (1815) an early safety lamp for coalminers exposed to methane ("firedamp"). He also wrote an ode to nitrous oxide. Davy's treatise, Researches, Chemical and Philosophical; Chiefly Concerning Nitrous Oxide, or Dephlogisticated Nitrous Air, and Its Respiration (1800), was read more widely than its title might suggest; and Davy himself was later to become a famous and influential public figure. So it is perhaps surprising that his prescient idea for the use of nitrous oxide as a surgical anaesthetic was not acted upon sooner. Unfortunately, the proposal was made in a throwaway line toward the end of his book; and Davy himself showed little interest in surgical medicine.